t had seemed simple enough. The Wright brothers had based their initial plan on a fact of nature that most of us discover as children. 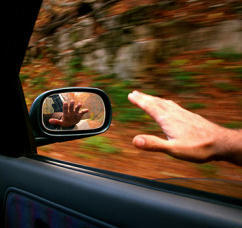 Stick your hand out the window of a moving car and bend it at the wrist to catch the wind. The air pushes your hand up. Bend it the other way and the air pushes your hand down. Air exerts a force as it flows past a surface; change the angle of that surface in the airstream and it changes the force – this is basic aerodynamics. 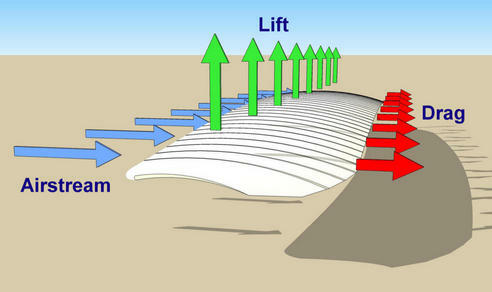 Find the right combination of movable surfaces and you can balance an airplane in flight – this is aerodynamic control. 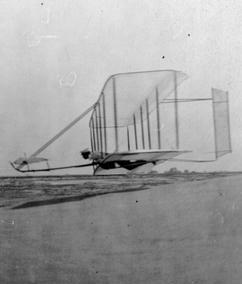 Working from that simple premise, the Wright brothers set out in 1899 to create an effective aerodynamic control system for a flying machine. They had modeled their control system after birds. Their horizontal rudder – what we now call an elevator – pitched the nose of their gliders up and down, doing the same job as a bird’s tail feathers. An ingenious system of pulleys and wires twisted or “warped” the glider wings, increasing the angle at which the wing met the airstream on one side of the aircraft and decreasing it on the other. This performed the same function as the flexible wings of a bird, rolling the glider right or left. Pitch and roll control should have been all that was needed to balance the glider and keep it pointed straight ahead. After all, this was all that a bird seemed to need. But it wasn’t that simple. The Wrights’ first two years had been occupied finding a wing shape and size that would keep them aloft for more than a few seconds. They built two gliders that didn’t live up to expectations, then – to avoid a third disappointment – did painstaking wind tunnel research on lift and drag, the forces generated when air moves over a wing. It paid off. They used the wind tunnel results to design their third glider and when they tested it at Kitty Hawk in 1902, it generated sufficient lift for them to make long glides. And it was during these longer flights that they finally had enough time to thoroughly test their roll-and-pitch control system. There were problems. Their simple system of movable surfaces produced unanticipated and confounding results. They had some indication of these problems the year before when flying their second glider, even though it was a poor flyer. When in the air, the nose seemed to hunt and the 1901 glider wandered of course. The problem got worse when they warped the wings. Pitch control had worked fine, but roll control was dicey. When a wing dipped to one side, Wilbur – who was doing all the flying at this point – would kick the T-bar at the back of the glider. This in turn twisted the wings, increasing the angle at which they met the wind on the low side and reducing the angle on the high side. Will had added a fixed tail to the 1902 glider in hopes of avoiding this well-digging. There were two vertical panels of cotton muslin mounted on outriggers sticking out behind the wings. The panels did not move; they were not part of the control system other than Will hoped their presence would keep the nose of the glider pointed straight ahead. They did not. When a wing dipped and Will or Orv – both the brothers were flying now – warped the wings to balance the glider, the nose turned toward the low wing. 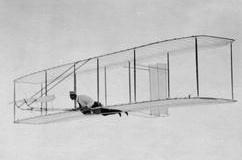 The Wright brothers were not trying to turn the glider in the air, not at this point in their carefully thought-out test flights. They made slight S-turns to test the effectiveness of the wing-warping controls, but otherwise their intention was to keep the nose pointed directly into the wind. 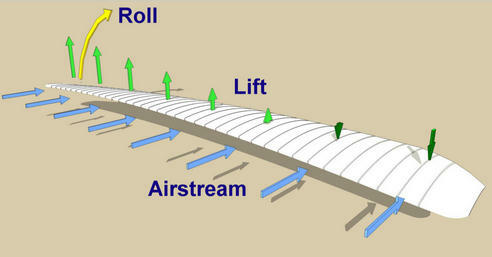 The purpose of the roll control was to keep the wings level and make small corrections if the glider wandered off course. In a turn, a pilot purposefully drops a wing in the direction he wants to turn the aircraft. The aircraft swings in an arc around the low wing. 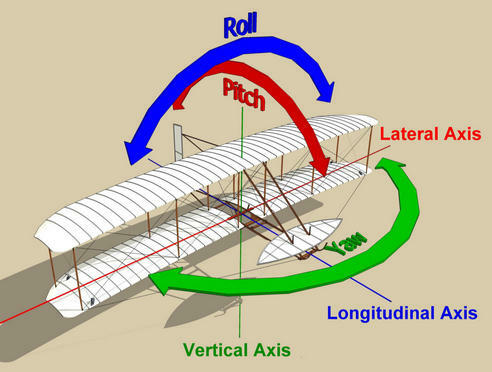 In this procedure – which the Wrights would not attempt until 1904 – the pilot drops the wing by decreasing the angle at which the wing meets the wind (the angle of attack). The maneuver that was giving the Wrights fits was just the opposite of a turn; it was what pilots do to stop a turn. A gust of wind or some other vaguery of the atmosphere would cause a wing to drop. If left in this position, the glider would begin an unintentional turn and in a few moments would no longer be flying into the wind. Furthermore, if the pilot attempted to land in this attitude, the low wing would catch the sand and the glider would cartwheel. To avoid these problems the pilot had to raise the low wing and return to level flight. He did so by increasing the angle of attack on the low wing. The nose of the glider was yawing toward the wing with the highest angle of attack. On the evening of October 3, 1902, Orville could not get to sleep and decided instead to mentally walk himself through the yaw problem. Orville had helped his brother with the wind tunnel experiments; in fact he had designed the balances that precisely measured lift and drag. He had an intimate understanding of the forces in play on a flying wing and could easily paint a mental picture of them. An experiment in aerodynamic control. 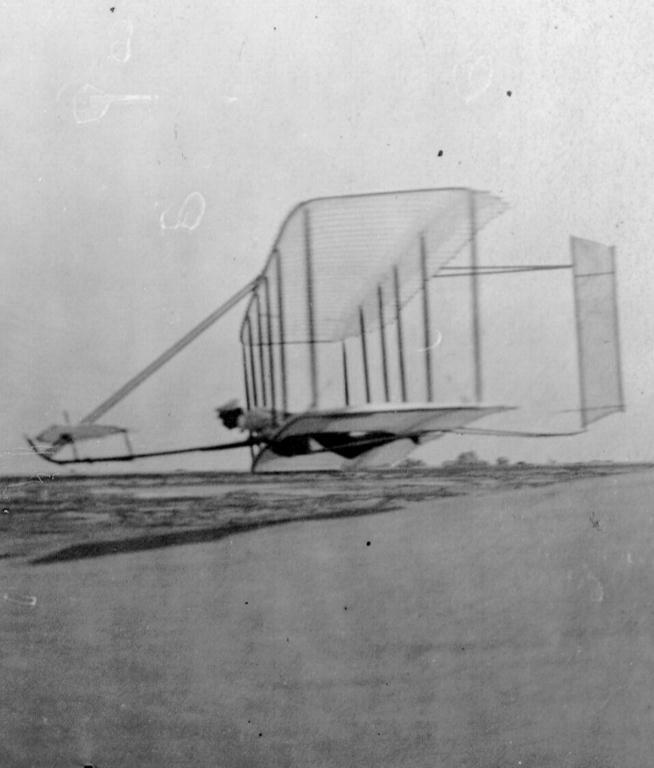 As part of their control system, the Wright brothers twisted or "warped" the wings of their gliders similar to way birds seemed to move their wings. This illustration is from James Bell Pettigrew's Animal Locomotion, one of the books Wilbur studied in preparation for the Wrights' gliding experiments. 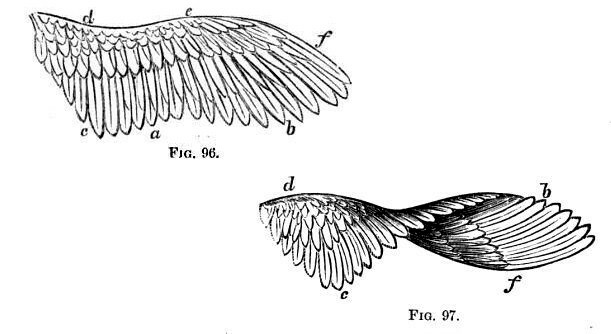 Neither the 1900 Wright glider (top) or the 1901 glider (bottom) produced the predicted amount of lift. 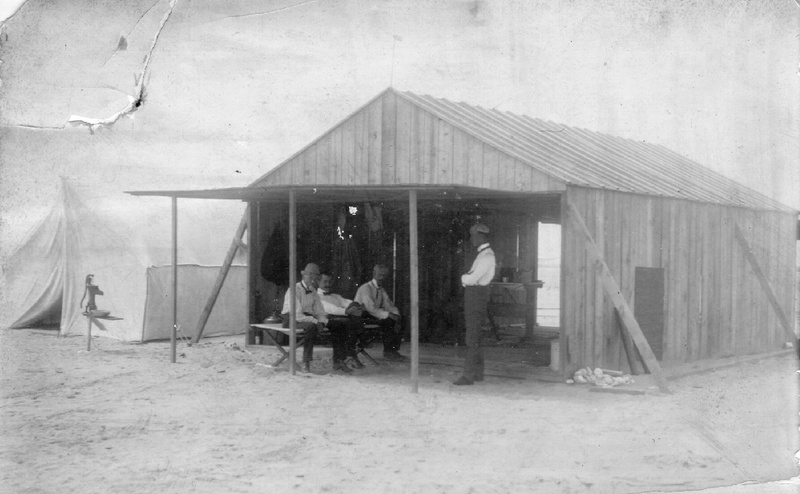 The Wrights' well at Kitty Hawk – it was not dug in the traditional sense; the pipe was hammered into the sand. 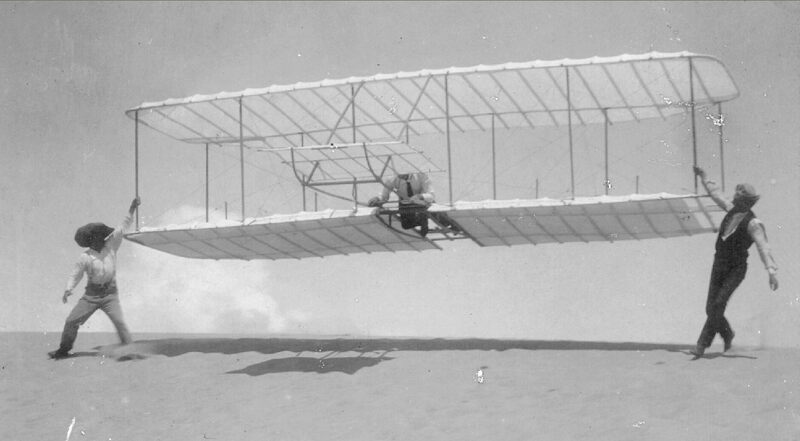 Initially, the 1902 Wright glider had a fixed tail – the vertical panels did not move. Imagine the glider as if it were balanced on the point of a pin as it traveled through the air. Just as it moves in three dimensions, it rotates around three axes that pass through the pinpoint. It pitches nose up and nose down around the lateral axis (red) and rolls one wing up and the other down around the longitudinal axis (blue). Finally it yaws nose right and nose left around the vertical axis (green). 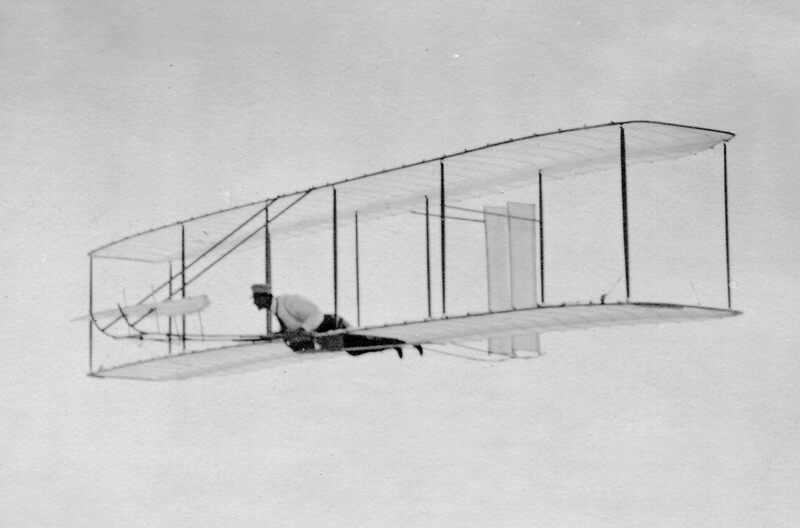 The Wrights’ initial control system – elevator and wing-warping – balanced the glider in pitch and roll. They had hoped to stabilize the yawing with the addition of a fixed tail, but it wasn’t working. Now add the forces in play. 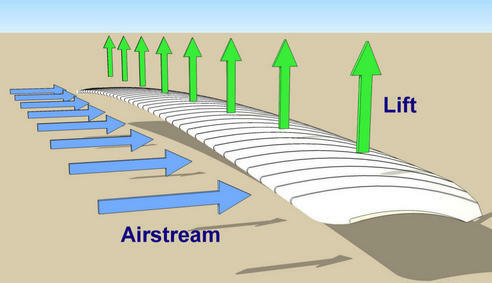 When an airstream (represented by the blue arrows) moves over and under a wing, it generates lift (green arrows). When the wing is straight – not warped or twisted – it meets the airstream at the same angle of attack all along its length. The lift generated by the airstream is equal all along the wing. The wing is balanced around its longitudinal axis and has no tendency to roll. 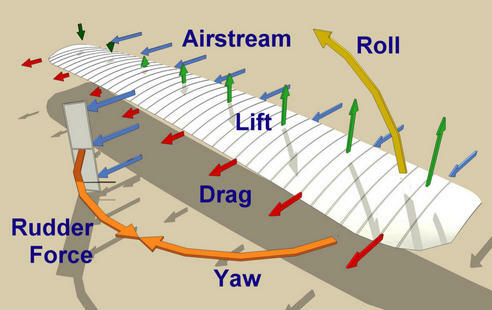 In addition to lift, the air moving over and under the wing also generates drag (red arrows), a force that impedes the travel of the wing through the air. 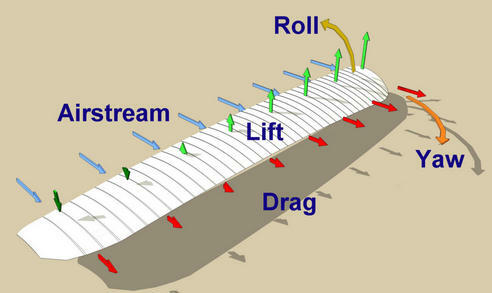 Like lift, the drag is uniform all along the length of the straight wing. The wing is balanced around its vertical axis and has no tendency to yaw. 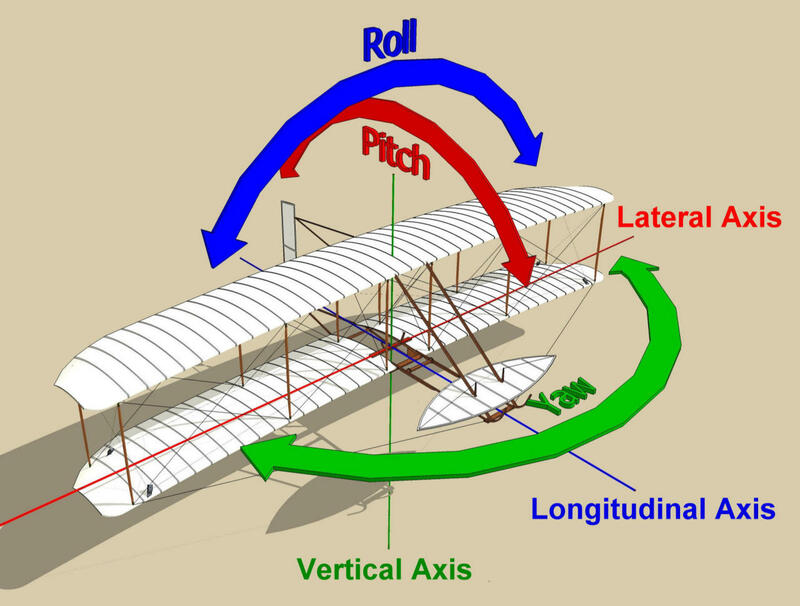 The Wright brothers’ control system twisted the wings around their lateral axis. As the wings were warped, the angle of attack increased at one wing tip and decreased at the opposite wing tip. When warped, a flying wing no longer produces uniform lift along its span. In general, as the angle of attack increases, so did the amount of lift. On those sections where the airstream blows directly on the top surface, it might even produce negative lift (dark green arrows), pressing down on that part of the wing. With more lift on one side of the longitudinal axis that on the other, the wing wants to roll (yellow arrow). The angle of attack also affects drag. In general, as the angle decreases, so does the drag. On those wing sections where the angle goes negative and the wind is pressing on the top surface, the drag will begin to rise again. But on the average, there is more drag on the side where the angle of attack is highest. 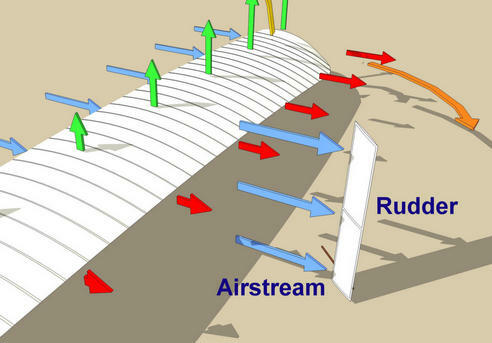 This in turn will cause the wing to yaw (orange arrow). This is what was making the nose of the glider to hunt toward the low wing! If the glider was close to it’s minimum flying speed, producing just enough lift to stay airborne, the sudden yaw would cause one side of the wing to speed up in the airstream while the other slowed and stalled – stopped flying. The glider would drop toward the stalled portion of the wing and ka-bam! Well-digging. Orville reasoned that this tendency – now called adverse yaw – could be countered by modifying the tail and incorporating it in the control system. 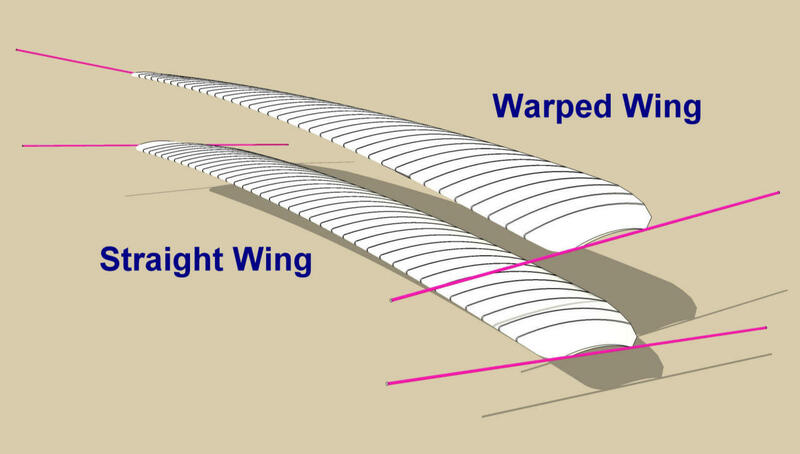 Convert the fixed tail to a movable rudder and turn it in the airstream toward the side of the wing that was producing the least amount of drag. The airstream would press against the rudder surface creating a force that, when added to the unequal drag, opposed and stopped the tendency to yaw, restoring balance around the vertical axis. The aircraft would still roll around the longitudinal axis – there was no opposing force to stop it – but it would do so while traveling straight ahead with no tendency to wander off course. Before breakfast the next morning, Orville called Lorin aside. Lorin, who had decided that his brothers Will and Orv were having way too much fun in Kitty Hawk, had traveled from Dayton for a short visit. Orv confided to Lorin that he had made a discovery during the night and he predicted what would happen next. When Orv told Will about adverse yaw and how to counter it, said Orv, Will would immediately shift into his big-brother mode and get all lofty and condescending. Orv warned Lorin that Will would probably brush his discovery aside, Orv would defend it, and this would likely be the beginning of one of their classic arguments, arriving at the truth only after Will and Orv had screamed and shouted at one another for hours. At breakfast, Will listened carefully to what Orv had to say. This was followed by several minutes of silence, during which Orv and Lorin waited for the opening shots in the war of words to come. But nothing happened. Wilbur apparently knew an epiphany when he heard one. He quietly agreed with Orville, and then surprised him by proposing a further modification. The Wrights had dispensed with the awkward T-bar used in previous gliders to warp the wings and were now using a cradle they moved with their hips. Wilbur suggested to Orville that they should tie the rudder control into the hip cradle. At this point in their test flights, the rudder was needed to counteract adverse yaw only when the wings were warped. It made sense to tie these two controls together – less work for the pilot. Over the next few days, the Wrights converted the double-surface fixed tail to a single-surface rudder. They first flew the glider with a rudder on 8 October 1902, and were rewarded by the results. It would need tweaking, but the rudder plainly countered the dangerous yawing. Later, this three-axis control system – pitch, roll, yaw – would become the basis for their patent. Much later, it would be recognized as a milestone in the history of technology. 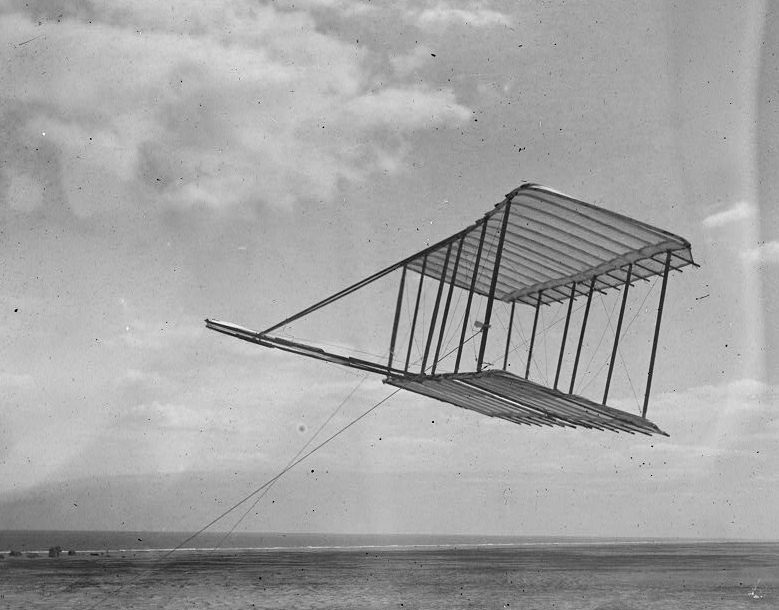 The 1902 Wright Glider was the first flying machine to have three-axis aerodynamic controls. 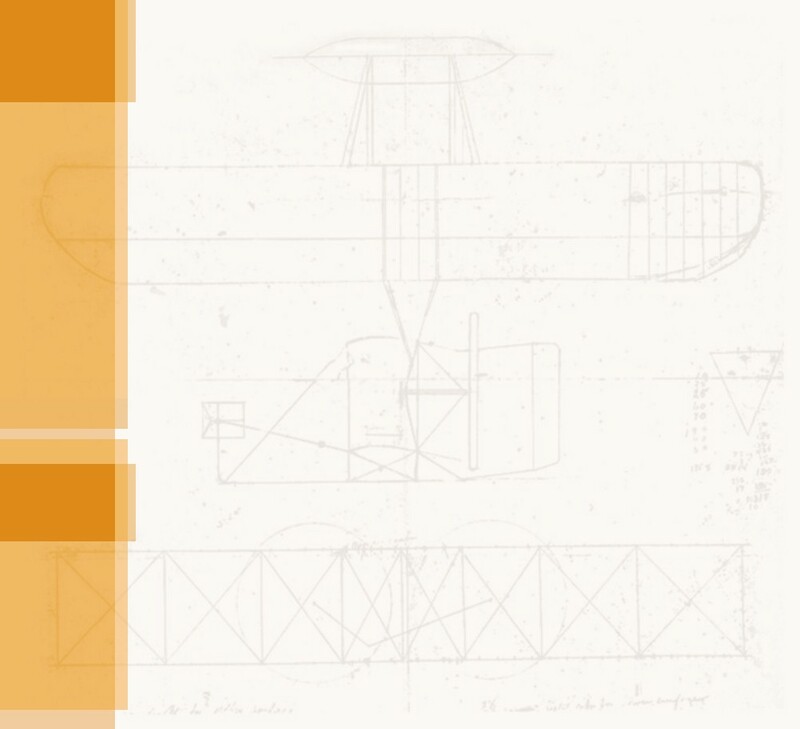 In 1914, the Wright patent was adjudicated to be the “grandfather” patent of the airplane, the beginnings of the aerospace industry and the jumping off point for an adventure that has yet to end. Note: For a printer-friendly PDF version of this page, click HERE. 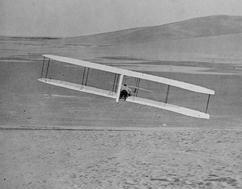 Orville Wright flies the 1902 Wright glider, now equipped with a rudder. He keeps the aircraft very close to the sand, skillfully following the slope of the dune. Without effective roll control, this maneuver would have been dangerous – the pilot would have risked sticking a wing in the sand. 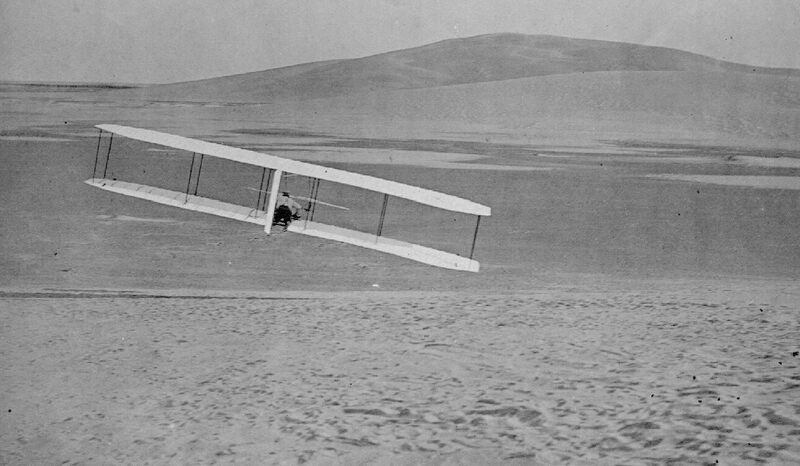 The Wrights' brother Lorin, who had come to Kitty Hawk to visit Will and Orv, probably snapped this picture.